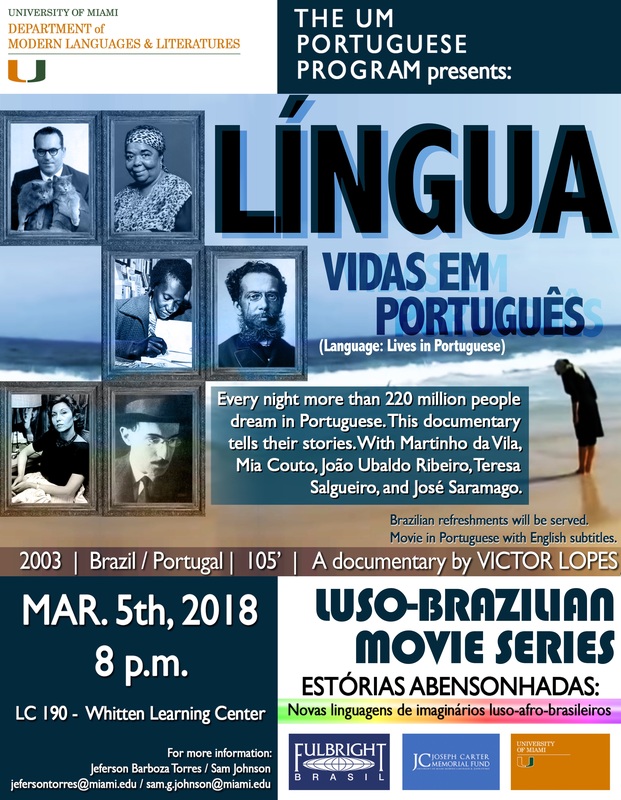 This film leads the viewers into a journey through the connections between Brazilian music and poetry. 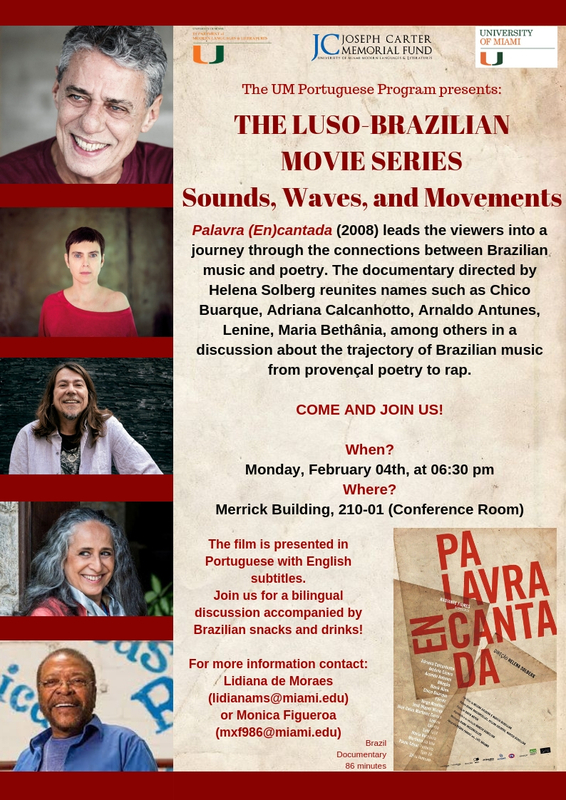 The documentary directed by Helena Solberg reunites names such as Chico Buarque, Adriana Calcanhotto, Arnaldo Antunes, Lenine, Maria Bethânia, among others in a discussion about the trajectory of Brazilian music from provençal poetry to rap. Set against the turbulent atmosphere of the 1960s, Tropicália (2012), directed by Marcelo Machado, explores the Brazilian artisitc movement known as tropicalismo, and the struggle its artists endured to protect their right to freely express revolutionary thought against the traditional music of that time. 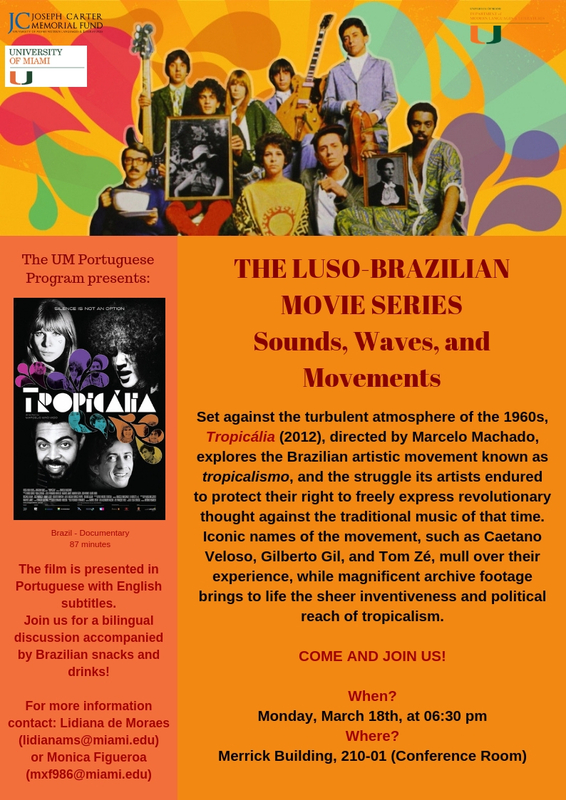 Iconic names of the movement, such as Caetano, Veloso, Gilberto Gil, and Tom Zé, mull over their experience, while magnificent archive footage brings to life the sheer inventiveness and political reach of tropicalism. All movies will begin at 6:30PM in MLL Conference Room (Merrick Building 210-01). Brazilian Refreshments will be served. All films will be shown with English subtitles. For more information on Portuguese Programming, visit our Facebook Page.